As I begin writing my 1001st post, (and since Thanksgiving is soon) I wanted to take a moment to talk a little about my business and how grateful I am for the success I have had. I started Honeybear Lane in 2009 as an Etsy shop. I was getting back to my creative roots after spending so much time being a full time student and then a first-time mom. My best friend was pregnant with her first baby and I wanted to make her daughter something special–this puff quilt. It was something I had always wanted to make, ever since seeing one on my sister’s bed long ago. So I figured out how to make a puff quilt on a machine, since I was not about to hand sew one. 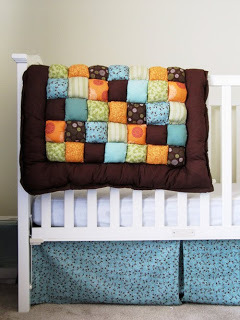 You can see this first puff quilt was pretty rough and over the years I perfected the method. And from this quilt came a whole creative DIY website, tons more quilts and patterns, and so much more success than I ever would have imagined back then. I really am so incredibly grateful for my business and all the blessings that have come through it and for it. When thinking about who influenced me the most in my business, I would say it was everyone around me–my husband, my best friend, my family, my parents, other friends I made along the way, and especially all of you! All of those people really helped me to form my business to what it is now. They have given me ideas, support, encouragement, and information about running a business. They always seemed so impressed and amazed that I turned my passion into a money-making business that partially supports my family. Running a business is never a solitary effort, even if you are technically doing it by yourself. You are always being helped by anyone who gives you advice and encouragement. I would have given up long ago if I didn’t feel the support from everyone around me and from you! Another key to my success is being truly passionate about what I do. I enjoy writing, but the true passion lies in the projects that I create. I love decorating my house, doing DIY projects, cooking, crafting, and whatever else you may find here on my website. I will confess that not every project has been my favorite thing, but no business is 100% fun. But seriously, almost everything I do on here is something that I really loved doing. And there are many things I have made and haven’t shared on here because I just ran out of time. You know you love something when you will do it regardless of whether or not you make money. Sometimes I’ve thought about quitting the website, but then I realize that I would be doing the projects anyway, so I might as well blog about it and continue my business. There are so many little nuggets I’ve gleamed over the years that I can’t tell you them all. I could probably write a book about it all. But I wish that I could go back and re-photograph my old projects and re format all my early blog posts. I don’t just get on the blog and aimlessly blather on (well, sometimes I do). I have a specific formula for each post and what makes them more accessible on the internet. And I try to stick to an editorial calendar…without that I would be a disaster. Every time I book a new campaign, I write the deadlines on my calendar so I don’t miss anything. I’ve learned to make things regardless if ‘they’ve been done’ because pretty much everything has been done before. But I always put my own spin on it to make it unique in some small way. I’ve learned to deal with internet trolls and rude people–ignore it! I’ve learned to manage my income more. And I’ve learned countless new skills when it comes to DIY. I feel so much more at ‘intermediate-advanced’ level on crafts that I used to be a novice at. And I love sharing my knowledge! Do you own a small business? The UPS Store wants to hear inspirational #viastories. These are small business stories that came about ‘via’ someone or something that inspired you to start a small business. Check out their site and read all the inspirational small business stories and then share your own! Post on any social media site but remember to use the hashtag #viastories and then enter to win a $50 gift card here! This post was sponsored by The Motherhood and The UPS Store. All opinions are my own. I enjoy your blog and the great creative ideas you introduce to us. I love your story. I helped my aunt turn her passion of craft (quilt) into business a few years ago #viastories. Thank you Heidi for the story. I’ve been on your blog for years and have always enjoyed your DIY projects and humorous stories.